Indeed, the designers of Porsche were able to create a truly legendary appearance, remembered by all car lovers. 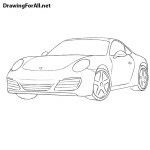 And car lovers and readers of drawingforall.net very often asked us to show how to draw a Porsche easy, and we decided to do this lesson using the example of the legendary Porsche 911. As in the other lessons, we begin by using very light lines to accurately draw the outlines of the Porsche body. 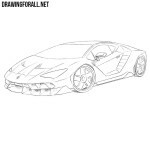 The contours should be very smooth, in contrast to the sharp contours of Lamborghini. First of all, we outline the hood, then the roof and the back of the Porsche. Do not try to push too hard on the pencil. Now we need to make our sketch more like a car. To do this, we will now outline the contours of the main parts, such as headlights, windows and wheels. All these details also need to be sketched using very light lines. The headlights must be oval, and windows must be sufficiently narrow. We continue to add details and make our drawing more similar to the Porsche 911. Let’s sketch out the contours of the radiator grille at the front of the car. On the side surface draw the outlines of the rear-view mirror and the door. Now quite a difficult step – we outline the arches and make the wheels more voluminous. These were the main outlines of the Porsche 911 and, starting with this step, we will draw out the car with clearer lines. With these dark lines, we need to draw the oval headlights, the hood and air intakes on the bumper. Do not forget to remove the unnecessary lines and draw the Porsche logo between the headlights. Now let’s move to the top of our Porsche 911, gently tracing the outlines of narrow windows, rear-view mirrors and the flat roof, which smoothly passes into the back. Clean the top of the drawing from unnecessary guidelines as in the example below. In this fairly simple step, we will finish drawing the body of our cool Porsche 911. Carefully draw out the door and outline the handle. By the way, as we have said, the body of the Porsche 911 has not changed much over the years, so using this lesson you will be able to draw models of past years. 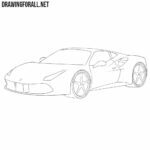 This step of the tutorial on how to draw a Porsche easy will be quite difficult, since the wheels that we will have to draw here should be as smooth and symmetrical as possible. Using the eraser, we delete all the remaining unnecessary guidelines from the Porsche drawing. And in the last step of our easy drawing lesson we will draw the rims. Try to observe symmetry and evenness when drawing the rims of your own Porsche 911. You can leave the picture as in the example below or add shadows and colors. 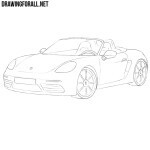 In the guide on how to draw a Porsche easy we showed the process of sketching this cool sports car in the most simple way. We tried to simplify all the lines and not add unnecessary shadows and details so that all our readers can learn how to draw a Porsche. 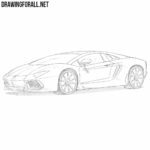 In fact, this lesson is a kind of general manual so that using the knowledge gained from this article, you could draw either other models or other versions with different facelifts (of which was a huge set in the history of the existence of this mad sports car). Above, you can see two more Porsche drawings that are made by the method we used in this drawing tutorial. 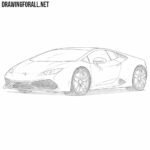 So be bold in experiments, draw more, practice and improve your knowledge in the field of drawing cars.